Teenage girls are more likely to truant from school but boys are more likely to be excluded because of bad behaviour, new research has found. A team at Edinburgh University made the conclusions while looking into the issues of truancy, parenting, gender and victimisation among young people. 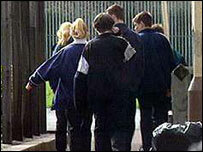 They also found that pupils who bunk off are more likely to smoke and be drinking under age. And at 15, half of all truants are thought to be taking drugs. The study is the latest in a series from the Edinburgh Study of Youth Transitions and Crime, which tracks the 4,300 young people who transferred to secondary schools in Edinburgh in the autumn of 1998. They found girls tended to be involved with certain specific forms of delinquency - theft from home, writing graffiti, and truancy - more often than boys. However, specific forms of more serious delinquency - carrying a weapon, housebreaking, robbery, theft from cars, and cruelty to animals - were much more common among boys than girls. The reports also found parents played a crucial role in determining the pattern of their children's behaviour as they became teenagers. and the kind of parenting a child aged 12 to 13 receives influences their delinquency at 15. David Smith, professor of criminology at Edinburgh University, said: "Put simply, the findings show that good parenting can prevent crime. "By contrast, parents who are inconsistent and harsh, and who easily give in to unreasonable demands, are more likely to see their teenage children turn to delinquency. "The reports also demonstrate the influence of a wide range of other factors, from socio-economic status to the community and environment young people grow up in. "But peers and parents have an important influence on top of these external factors."